Composer/percussionist Thomas Strønen’s Time is a Blind Guide has shifted membership since its debut recording. Distilled to a quintet line-up on Lucus, its latest outing for the ECM label, it retains a cohesive way of interacting that highlights a fluent interplay of textures. The Mediterranean-inflected album opener “La Bella,” the sole composition on which Strønen shares credit with Aase and Vågan, is a case in point. Fills from Strønen’s kit activate repeated notes in the strings and piano in a subtle build that gradually includes ever widening whorls of melodic snippets. Often Strønen wisely deploys the quintet as an interlocking set of two trios – string trio and jazz piano trio. This is done quite effectively on “Wednesday;” the jazz side of the ensemble plays in a smoky swinging groove while Aase and Railton perform a gentle rainstorm of pizzicatos. Vågan is an interloper, moving from walking lines to sultry arco playing. On the title track, also undergirded by a propulsive string ostinato, Tanaka supplies limpid impressionist cascades. The strings build up successive layers, creating countermelodies that arc around the piano and accentuate the undergirding material of the rhythm section. 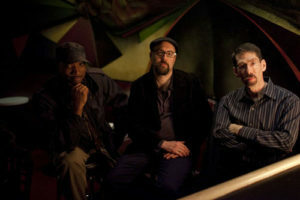 The double trio idea also prevails in the standout composition “Truth Grows Gradually,” in which the players revel in a complex yet catchy groove. Elsewhere, the ensemble activities vary. On “Baka,” the percussionist crosses over into the world of orchestral instruments, bringing out regular bass drum punctuations. “Friday” juxtaposes pizzicato solos with high string harmonics in a polyrhythmic duet enlivened by its textural contrasts. After an extended double bass introduction, “Tension” presents folk-tinged violin melodies and attenuated post-bop piano lines against a variety of jazz kit punctuations by Strønen. Gradually, Tanaka fills out the texture with rapid fire repeated notes against an expansive collection of string glissandos and harmonic minor pirouettes. The Eastern-tinged “Release” leads with a sweeping piano melody that alternates with oscillating strings and thrumming low register pedals. Oddly enough, “Release” is placed earlier on the disc than “Tension,” which would seem to be a corresponding antecedent. That said, the sequencing of these compositions flows organically with ample variety along the way. Whether performing again as a larger group or in the quintet that appears on Lucus, one hopes that Time is a Blind Guide are just getting started. Sorry to have missed posting about it yesterday – Happy Thelonious Monk Centennial! In my opinion there should have been parades! This year we celebrate the centenary of another member of jazz royalty, the incomparable vocalist Ella Fitzgerald. On September 29th, Verve released a CD of the singer in fine voice, accompanied by newly orchestrated arrangements performed by the London Symphony Orchestra. I am not often a fan of posthumous mashups, but this project is a beautiful tribute to an extraordinary artist.